Supports both Black Ops II and Black Ops III. Updated ffmpeg to v4.1 and NAudio to v1.8. Fixed saving of SABS/SABL files. 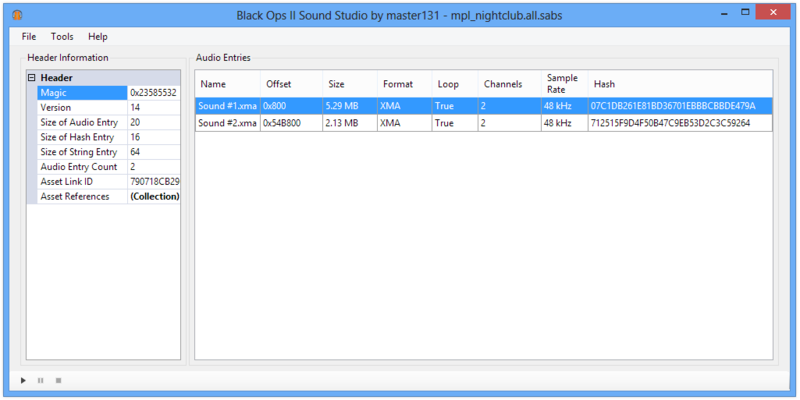 Added basic support for Black Ops III (beta) SABS and SABL files; save support has been disabled. Checksum fix disabled by default to possibly make it work for MP (toggle under Tools). Toggle between file name and full path (under Tools). Fixed playback and save of XMA audio with only 1 audio channel. Updated name database to support Apocalypse DLC on PC. Updated name database to support Vengeance DLC on PC. Added loop flag and sample rate detection. Updated name database to support Uprising DLC on PC. Audio replacement of XMA audio entries are currently not supported as an encoder hasn't been added yet. Audio replacement for PS3 is not tested. Backups are not created, it's up to the user to do that themselves. Editing the asset references list actually does nothing when saved to disk. This software uses a compiled/command-line version of FFmpeg licensed under GPLv3 built by Kyle Schwarz/Zeranoe which can be downloaded here along with the original source code. This tool is in no way affiliated with Activision Blizzard or Treyarch and does not contain any copyrighted files from the game, "Black Ops II" or "Black Ops III". How do I replace existing audio? Right-click on an audio entry and click on "Replace Audio". Browse to the file you want to replace the audio with (many formats supported, no manual conversion required). The tool will convert automatically to the correct format and highlight the audio entry. Afterwards, click File > Save or use Ctrl + S to save the changes to disk. How do I export audio entries? Right-click on the entry and click "Export". You can also export all entries within the file and retain the original tree structure (if available). How do I play an audio entry? Right-click on the entry and click "Play". Alternatively, you can click on the entry and click on the play button in the mini-player at the bottom. What's a good way to see if this works? Open "spl_frontend.all.sabs" and find "mus_bo2_theme.SL65.pc.snd". Right-click > Replace Audio and select your own audio to use. Repeat the same for "mus_bo2_theme_ambient.SL65.pc.snd". Now click File > Save (might freeze for a little) and close the program, then start singleplayer. When the main screen comes up, your custom music will be playing in the background. Please report all bugs if you encounter any. Thanks guys. I think I've found the cause behind the infinite SP loading bug, will check my theory out tomorrow. Playback and audio replacement of XBOX entries are currently not supported as the format is still unknown. please remove "Supports XBOX" from the features because it does not support XBOX, you cant export useable files from xbox with it. (07-14-2013, 00:48)green Wrote: please remove "Supports XBOX" from the features because it does not support XBOX, you cant export useable files from xbox with it. Can you learn to read at least? It can clearly read the structure fine because it's the same as PC and PS3. Only the audio data remains unknown at this point. I'm currently reversing default_mp.xex to determine how this data is played (the fact that consoles use PowerPC makes it more difficult). I've edited the main post because clearly people aren't reading the problems/limitations list.